This is the way I watch TV, this is the way I watch TV, This is the way I watch TV all through the day…… See, my little baby has grown up. She has been crazy over kids’ programs nowadays especially brainy baby and Barney. “Like parents like daughter”, mummy and daddy like movies too. But, I really don’t like her to lay down while watching TV. Obviously, it will affects her eyes sight later on. Anyway, I still think watching educational videos is good for her. She learned a lot of things from them. How I wish there is mini home theater seating. So that I can get one for her. I guess this is the only way to stop her from lying down. 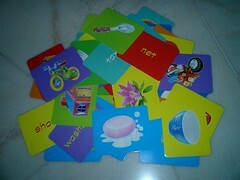 Auntie, Auntie, this is my new flash card. They are so colorful compared to the old one. Mum bought it in MPH, Gurney Plaza, Penang. 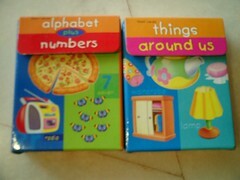 They are from Future Ace Publishing, RM 15.90 each ( about $5 USD). Mum said it’s quite cheap for its great quality. 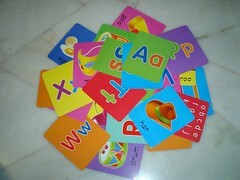 Mummy also said that she want me to learn about things around me, ABC and 123 first, so I only have 2 sets now. 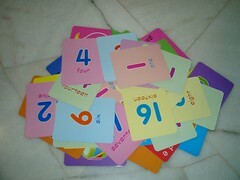 They are actually 6 sets including animals and A to Z; addition and subtraction; at school, colors and shapes; party toys and games.